to that horse's page for more info, etc. 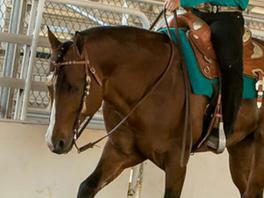 Breeding Stock classes and ...She got many compliments from the judges about her trail class performance. 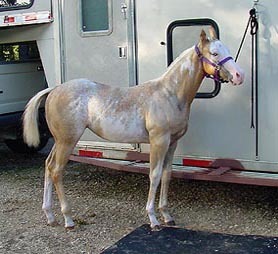 She was the STP Year End Open Show High Point winner in 1999.
out of 12 in her class. ROM in Halter (42) and Western Pleasure (37). Points in Trail (7), Disapline Rail W. (7), Western Riding (7), English Pleasure (4). Many Show and Year End high point and class awards and many, many compliments from the judges. 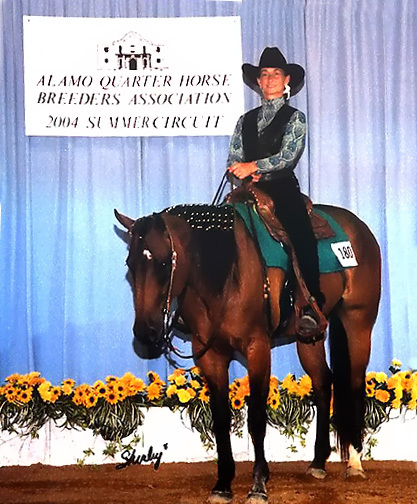 She was the hi-point buckle winner at the San Antonio Livestock Exposition's very first Open Horse Show in February 1996. 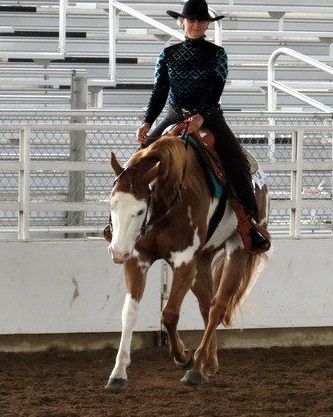 Shown in one APHA Show where he earned 2 points in NovAmateur Western Riding. 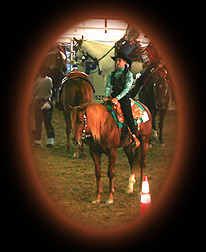 Shown in one STP Open Show where he was the High Point Show winner November 26, 1995. Shown in PtHA Youth earning many points. He is the half brother to TC above. Now this guy was really going somewhere...After only being under saddle for 8 weeks he went to his first show were he got a 1st and 3rd in Trail with 8 in the class earning 2 APHA points. He showed against several long time professional trainers in the pen. He was undefeated as a yearling in Trail-In-Hand. 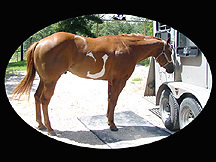 PtHA = 32 Halter points 70 Performance points in Open and Amatuer. Show career was short lived. 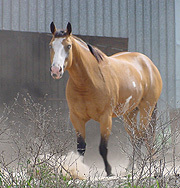 He was Pinto Area Champion in Trail in his very first show - October 2001. He has 5 Trail points. Pepper's show career kicked off with a bang on Sept 7, 2002. 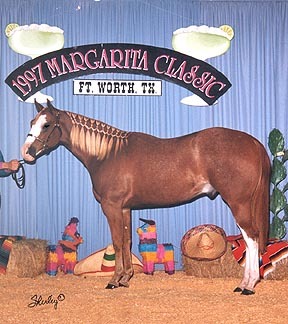 She was a money winner in the STP Futurity, Weanling Stock Fillies. And earned several points in Halter. After only 90 days of training under saddle he was taken to his first show where he took a 1st & 2nd in Open Trail and a 2nd & 3rd in AM Trail. At his second Show with just 115 days under saddle he took a 1st and two 2nds in the 2yr old Snaffle Bit Western Pleasure, two 1sts and a 2nd in the Open Western Pleasure. Three 1sts in Open Trail and three 1sts in Am Trail. 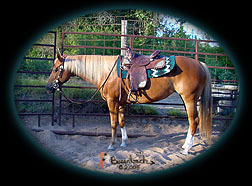 Open Western Pleasure, and Am Horsemanship. He is out of our Blazing Hot mare, Hot Soxy and by Awesome MrConclusion. He is showing some very promising potential. 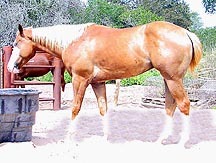 Slow, quiet, easy going personality, natural low head carriage, pretty movement. 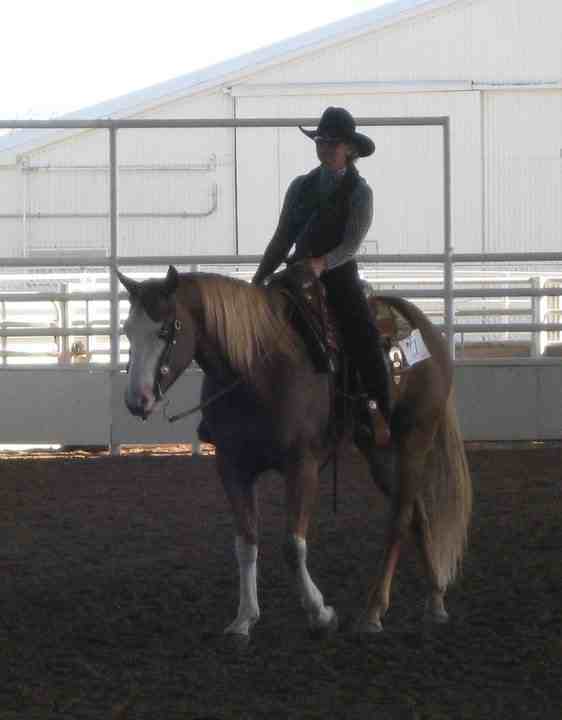 a first and second in Discipline Rail Western, a 1st place in Reining and a 3rd place in Trail...WAY to GO CASH!